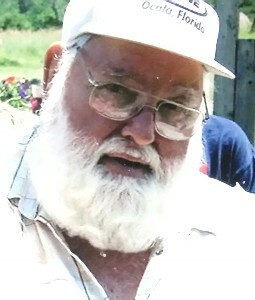 Frederick “Russell”,, “Fred” Chilton, 78, of Williamstown, formally of Hermon, died on July 25, 2013. There will be calling hours, Friday, August 2, 12 – 2 PM at the funeral home, a memorial graveside service will follow at 2:15 PM in Hermon Cemetery, Lay Pastoral Assistant Martha Helmer officiating. Russell is survived by his daughters, Kathy House and her companion Luis Elias, Port St. Lucie, Florida, Diana Lee, Florida, a brother Reginald “Reggie” and his wife, Sophie Chilton, DeKalb Junction, grandsons, Jason and wife, Crystal House, Gary and wife, Celeste House, Michael and wife Sarah House, 5 great grandchildren, several nieces and nephews. He was predeceased by a son James Chilton, a brother James R. Chilton, and a sister Rebecca Ruth Denn. Russell was born on April 10, 1935 in the Town of Canton, the son of James Virgil and Dorothy Ruth Hill Chilton. Marriages to Donna Pritty, Aletheia Knapp and Marilyn ended in divorce. Russell owned and operated Chilton Excavation, after his retirement he moved to Florida. He was a member of the Old Time Truckers Association, the Teamsters Union and an honorary member of his hunting club. He loved spending time with his family, playing Santa Claus, coast to coast truck driving (his own tractor trailer), traveling, four wheeling, and was an avid hunter. In lieu of flowers contributions can be made to the American Heart Association. Fred…God speed my friend, hope you can get a good breakfast up there, always a pleasure to cook you breakfast over the years!! To Kathy and Fred’s entire family: I am so sorry for you loss. You are in my thoughts and prayers. The little I know about Fred, but most important, is that he is well loved by his family, especially his grandchildren and great-grand children.